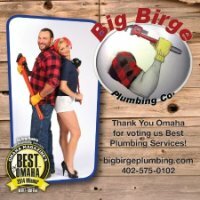 We Recommend: Big Birge Plumbing Co.
Brad Birge has over 15 years of plumbing experience that he brings to Big Birge Plumbing. Services include plumbing, kitchen remodels, bathroom remodels, inspections, and backflow services. Birge is committed to providing the best level of service to his clients and he makes sure the job is done right every time!